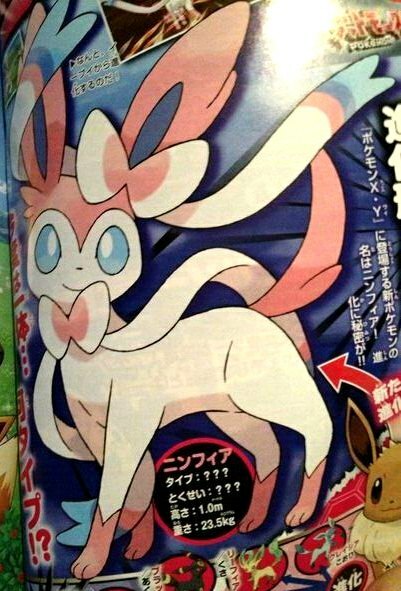 Japanese magazine CoroCoro has revealed a new Pokemon called Ninfia (English name not known yet). It is a new Eeveelution and will be seen in a Pokemon short, Eevee and Friends , that will be shown before a new Pokemon movie in the future. However no type or ability were revealed, nor was the method of evolution, leaving open the possibility of new types or completely unique evolution methods. Ninfia is 1.0m (3ft 3in) tall and weighs 23.5kg (52 lbs). Click the image to the right to see the larger image.